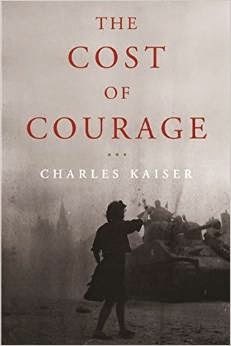 Recently I had the good fortune to receive an advance reading copy of Charles Kaiser’s new book, The Cost of Courage, the story of the Boulloches, a French family living in Paris under Nazi occupation. The book is a knockout on every level: as history; as a wise and insightful meditation on human nature; and most of all, as the gripping true tale of three fascinating siblings who had to make the most difficult decisions under the most dire of circumstances, decisions with lifelong and even generational costs. I cried more times reading it than I care to admit (bad for my brand, I know)—especially at the beautifully resonant last line and the final photograph. Part of what makes the story so compelling is how long it has remained untold, and how personal it is to the author. It’s not an exaggeration to say that if Kaiser hadn’t met and fallen in love with this remarkable family in 1962—through an uncle, Henry Kaiser, who stayed with the Boulloches as an American army lieutenant stationed in Paris in 1944—the details of what André, Christiane, and Jaqueline Boulloche achieved and suffered as part of the French resistance would never have been known. The siblings were determined not to speak of it, instead silently commemorating their losses with a private ceremony every year at the family plot at Père-lachaise, Paris’s largest and most celebrated cemetery, a ceremony that always included their children and grandchildren but also left the new generation feeling like outsiders, unable to really grasp the mystery of what André, Christiane, and Jaqueline had sacrificed and endured. But Kaiser’s long presence in the Boulloches’s lives and in particular his close relationship with Christiane won out, and the result is a Tiresias-like tale, told by someone with the access of an insider and the perspective of an outsider. I have to add that Kaiser’s publisher, Other Press, has packaged the book beautifully. The cover art, jacket copy, photographs…everything distills, amplifies, and resonates with the story itself. In my experience, publishers tend to get these things wrong more often than they get them right, but when it happens this well, it’s really a pleasure. I finished the book a week ago, and it’s been on my mind ever since. Sometimes consciously, where I’ll find myself thinking of certain scenes— André, shot by the Gestapo and unable to access his cyanide pill before he’s captured; several heart-stopping narrow escapes; a beautiful moment at the end, where Kaiser…well, you should read it yourself. But other times it’s more just a lingering sense, a presence you feel even if you’re not consciously aware of it. It’s a lovely feeling, and for me, one that only happens with the really great books. This isn’t a long story, yet upon completion it carries the resonance of something epic. I highly recommend it.